65. After the joining of the two capsules (BMUFOR Note: Apollo-Soyuz spacecraft, July 17, 1975), which will take place soon and very quickly, you will also be able to photograph several satellites, of both terrestrial and extraterrestrial origin. 66. After that we will fly off and be received by our great spacer that is stationed in this system, with which we will then be taken to several other systems, galaxies, and the Universal barrier, where I have to fulfill a mission. 166. Our last jump (BMUFOR Note: Hyperspace jump) will be to the Andromeda Galaxy, which rests, as seen from Earth, at a distance of roughly 2.2 million light years. 167. From there we will set for the great leap to the Universe barrier by which we want to give you the seven minutes opportunity to experience the timeless. (…) Where actually are we now? The sky is so empty, and I practically don’t see stars anymore. 173. We have reached our goal… we are almost at the end of the material universe. 174. Until we reach the barrier we will go through completely empty space, resp. the outer Creation belt up to the displacement belt. 175. Up to that point, there are now not only a few million kilometers, but many trillions of light years. 176. So we leave the actual material Universe resp. the solid-state matter universe belt, and go into the transformation belt and beyond, up to the very end of our DERN Universe, where across a barrier, resp. a Universal barrier, we will then create a passageway to the DAL Universe. 298. We have reached our goal. 250. That is our goal. 251. If you want, you can take a photo of it. 252. This structure is produced by a spaceship that you can recognize there, very far ahead in the annular center. 253. Here our Universe ends, and this structure stands as the gateway to another Universe, which we call the DAL Universe. Man, but this is enormous, it must certainly have close to 50 kilometers in diameter. And the length of this tunnel, man oh man. 299. You err very much in your measuring. 300. The diameter of the tunnel amounts to 177000 meters, and its length totals 7103 billion kilometers. Fantastic, but why are we getting so close to it? 301. Because we will cross over. Cross over??? To another Universe? 302. Sure, over to the DAL Universe. 303. That you will surely not, because you can cope with more than you want to admit. Do we have to go to another space-time dimension or something? And, what is it actually about this DAL Universe, that seems so familiar to me? 304. We will remain in the normal time and normal space. 305. You see, we are already far inside the tunnel, and nothing changes. 306. But as for the DAL Universe; does this not remind you of anything? 307. It’s a twin Universe of our DERN Universe. 308. We have crossed over; we are on the other side. This I can also see… You really are preparing surprises for me; but look there in front, there floats a large spaceship, and very far back are countless stars. 309. Sure, that ship there is our goal. Thank you for the flowers, but what are we doing now? 261. We are just about to switch back to our own universe. 262. Then we will spend a period of fifty minutes at the end of the barrier, in order to close it again. Will it take so long? 433. Sure, because we must not simply let it collapse, but rather systematically close it. 434. That simply takes its time and requires a very great care. 435. From universe to universe there are only very few points on the barrier which could be used as a transition. 436. Besides, they must not be excessively strained and also not overloaded, otherwise the barrier structure is destroyed, which could lead to a universal displacement belt disaster. 437. Everything must be carried out in very precise order and according to the given laws, which of course always takes its time. I understand; then I’m probably dispensable for the next 50 minutes? 263. We can talk calmly. 264. The whole closing procedure is programmed and it is handled independently without our specific input. That’s fantastic. Then could I address some questions to you, which I have been concerned with for a long time? 265. That was also planned. Good, thank you very much. First I would like to know, what will we do after the closure of the barrier is carried out? 267. It is planned to jump to different galaxies, where you shall visit with Semjase some planets and life forms. 208. Many of the pictures taken by you and me from the middle of last year have in the mean time found an extremely unworthy aspect. 209. Several of the pictures brought into circulation by you have since then been utilized in a way that is indeed quite positive, but also not favourable. 210. Some pictures were utilized to represent future technical interests of the Earth, and actually in a way which is quite outrageous. 211. Yours and my pictures were in fact in part imitated very accurately, to make drawings for research and future demonstrations, which is why the danger now exists that you are or will be accused of swindle. 212. In the meantime drawings exist in deceptive form of the Jupiter pictures and the picture of the universal barrier, which were accurately made according to your disseminated pictures as drawings. 213. In this regard the people will not consider that our pictures existed much earlier than these drawings were made. 214. The people of the Earth namely do not understand how to think that far ahead, that has also been proven with the pictures of Venus and Mars. Oh dear, not again. But what should I do against it? 215. The irrationality of the Earth people will leave you no opportunity to defend yourself, because the real facts are not rationally acknowledged. 216. Unrealistic scientists and illustrators are more likely to be believed than even you, as you will be decried as a dreamer, which you will already experience that by tomorrow, when you will receive copies of our pictures by indirect means. Oh my goodness, is it really already imminent? 218. – You should not try to defend yourself. 219. Remain silent, because any attempt would be futile. 220. The people of the Earth like to think and act in other ways than just according to the truth. Sigrid Kinet has sent me something that threw me off balance. Here, check this picture. This is what you talked about yesterday, right? 23. No, this here is something else. 24. I have misdirected the mail to you. 25. I have observed you pretty good today and noticed that only in the evening this mail directed to you very much upset you, so I misdirected the other mail to you to another place, where it can do no harm. 26. What you have here is a reproduction of an inspirationally transmitted image to a painter for the purpose that the people of Earth slowly get familiar with things, which will be created in the future. 27. That a picture of a universal barrier was used has specific reasons, which however I’m not allowed to mention. 28. Incidentally, this drawing is not very good, however the original production is a masterpiece. 30. Our picture shows the center of the barrier as an egg-shaped structure, as it is in reality, while on this poor imitation the center is circular. 31. Also the rays (BMUFOR note: radiation streams) have very big differences, as well as the foreground, where on our picture the wavy, iridescent energy can be seen, while on the drawing a landscape is depicted. We already saw that ourselves, but read here below, there is written that I published this picture here only in early 1976. I was afraid of that for a long time, also with other pictures, like for example of Mars and Venus. 32. But you already disseminated them in the middle of last year. Of course, I can also prove that, but what do you think, who cares about that? Now these pictures were shown on television on November 8, 1976, and months before pictures from Venus and Mars, and also Jupiter. Now it is said that I photographed them from television, although I already had them about a year before. 33. You already said that, but it is simply not understandable. 34. The earth human should at least think logically about these things. No such luck. There are also problems with the tricky Jupiter and Ptaah’s spaceship, because there were images shown on television this year once or twice that were devilishly similar to my pictures. 36. This is an animated film, which was also made by intuitive input, to prepare the Earth people for certain things. 37. Again, it also has a specific reason that my father’s Great Spacer was transmitted as an outline image. That’s of no use to me, because how am I suppose to explain that to people? I do not know it anyway. 38. We may have made mistakes with these inputs, that is possible. 39. But we also had to get to know the Earth people and their behaviour better. Certainly, nothing can be said against that, but what now? Oh nice, now I can take the blame, right? 41. It won’t be that bad. 42. Now you are nervous and demoralized, within a few days you will overcome these things, when you see things more realistically. 43. In your present excited condition you feel too despondent. Okay, you might be right. But tell me: is it really so damn important that I have to disseminate these images, which already were made in oil or otherwise and published by gifted sensitive painters in times before? 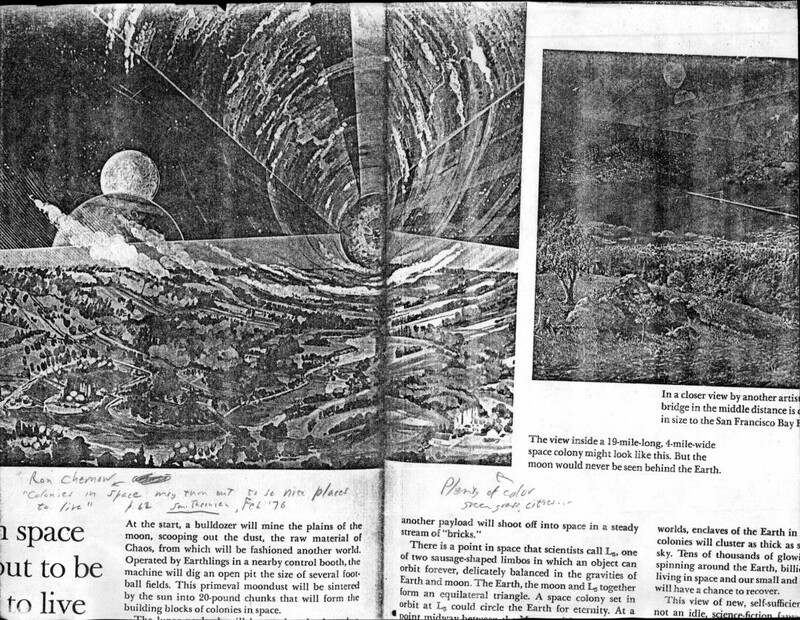 On p. 34 Korff implied that Meier, during or after his alleged 5-day space trip, drew a detailed picture of a tunnel-like connection to another universe he had been taken to (in a Pleiadean “mother ship”), and that the drawing is identical to an illustration of what NASA’s concept of a space colony might look like28. 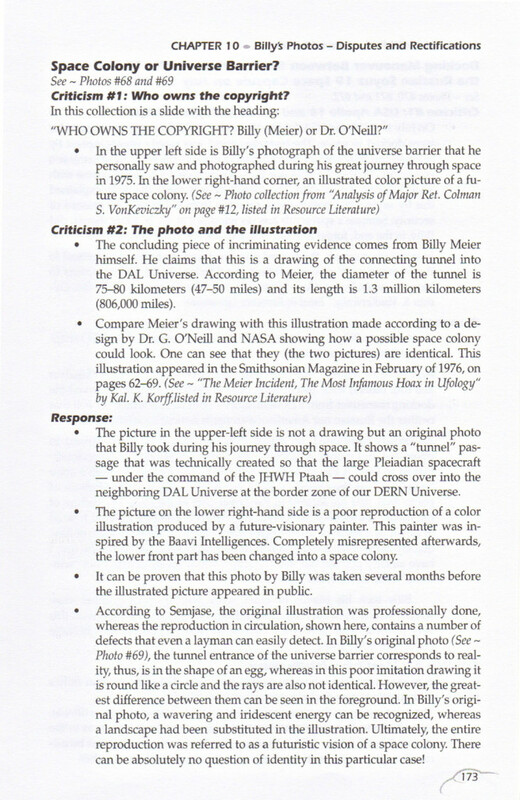 This was called “damning evidence,” implying that Meier had used the Illustration to fake the episode. However, Meier did not claim it was a drawing, contrary to Korff’s report. Meier’s explanation was that he had noticed the magazine illustration and had pointed out that if one squints at it, it resembles the way the tunnel had looked29. The magazine wasn’t usually available to him when the subject arose in conversations, so one day when he did have the proper issue on hand he photographed the illustration. It turned out to be in poor focus, since even with the repaired focusing mechanism, he couldn’t focus close enough while still allowing the magazine Illustration to fill the camera frame. However, this was not of concern, because it looked more realistic to him out of focus. In any case, what Meier claims to have seen is very unlikely to have looked identical to the illustration because the latter, full of various colors, shows segments of fertile hillsides with clusters of houses and trees, However, the latter features, and of course the colors, do not show up in the small reproduction of the illustration in Korff’s report. All this is omitted from Korff’s report. Note: After receiving clarification on this issue, Deardorff remarked to Wendelle Stevens in a letter dated March 11, 1988 that what he told to him on the Universal Barrier photo was “considerably different” from what Bruni’s information. In a letter dated March 22, 1988 Deardorff mentioned to Wendelle Stevens that he has revised his critique of Korff’s report (unpublished) with Bruni’s information. Then still the last question: over and over again, I am asked about the space photos of my great journey, namely in reference to whether these were traded around and became falsified. 302. You probably don’t mean the paper images but rather the slides. And how did it happen, then, that the shots resembled the conditions of reality? 304. Because our transmitted impulses were given to the Earth people in the form of impulse-images that corresponded to true, existent things of foreign worlds. Planets, suns, humans, apparatuses, dinosaurs, and plants – were all these things included? 305. That corresponds what was done. 306. But now, my friend, that must be enough of the questions. The statement that all the falsified pictures came from a future film seems to contradict what was already published by FIGU earlier about the pictures. For example, in CR 68, November 12, 1976 (See Messages from the Pleiades, 1st ed. Vol 3, pg. 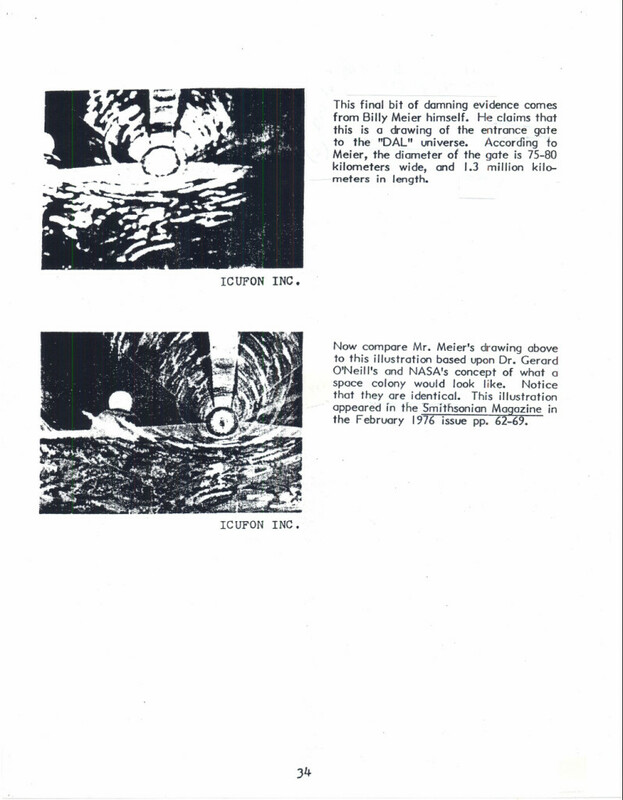 222, 1993), Meier says to Semjase that the pictures of the Universal Barrier which Meier allegedly shot during his July 17 Great Space Journey were shown on TV on Nov 8, 1976. He also says that the pictures of Venus, Mars, Jupiter, the Great Spacer etc. were shown on TV in a different program, a few months before. Also the Pteranodon picture which Quetzal identified as a fake and destroyed it was an illustration made by Zdenek Burian, published in 1972 in the book Life Before Man, written by Zdenek V. Spinar and first published in Prague. Also the cave men pictures are very similar to a 1965 illustration made by artist Rudolph Zallinger. This clearly shows there are many different sources of the falsified pictures which were allegedly inserted by MIB to discredit Meier: several TV programs broadcasted in a period of several months and paintings of different artists. When asked about the name and release year of this future film on the English FIGU forum, Meier replied in July 2014 that he didn’t know. leider muss ich dir auf diese deine Anfrage negativen Bescheid erteilen. Auf Anordnung von Ptaah hin wurde das an einer unserer Sitzungen vor einigen Jahren so beschlossen. Die Begründung liegt darin, dass alle diese Dinge, auch im Bezug auf Billy`s grosse Reise, schon mehrere Jahrzehnte zurückliegt und dass diesbezüglich alles notwendige schon mehrmals dargelegt wurde. Damit soll verhindert werden, dass diese alten und abgeschlossenen Dinge nicht wieder aufgewärmt und neuerlich verblendete und irregeleitete FIGU- Gegner auf den Plan gerufen werden. Unfortunately, I have to decline an answer to your question. By order of Ptaah this was decided on one of our meetings a few years ago. The reason is that all these things, also regarding Billy’s great journey, are already several decades ago and everything about it has already been said several times. This is to prevent that these old and closed issues are revisited again and again attracts blinded and misguided FIGU opponents. The late Guido Moosbrugger, core group member of FIGU, publishes a book – Und sie fliegen doch! 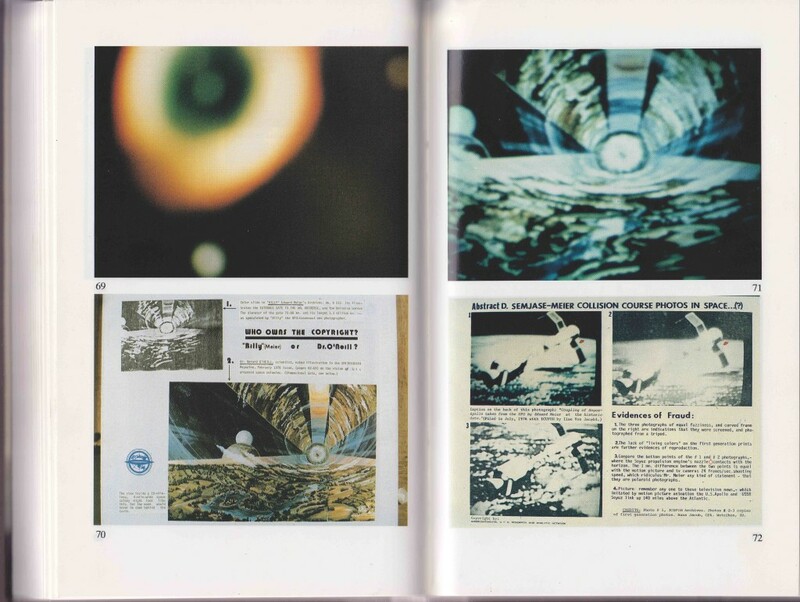 – in which on pages 269-270 he responds to the criticism on the Universal Barrier photo written by Col. Colman S. von Keviczky in his analysis and also by Kal Korff in his 1981 booklet. Later this book was published in English in 2001 and 2004 and an extended German version was also published in 2012. In all versions the rebuttal of Guido regarding the Universal Barrier photo remains the same. Below is the page from the 2004 English edition. For photos #68 and #69 mentioned in the page of the 2004 book below, see the photos #70 and #71 of the 1991 book (different photo numbers in different editions) under 1980-1981 – Analysis of Major Ret. Colman S. VonKeviczky, ICUFON. 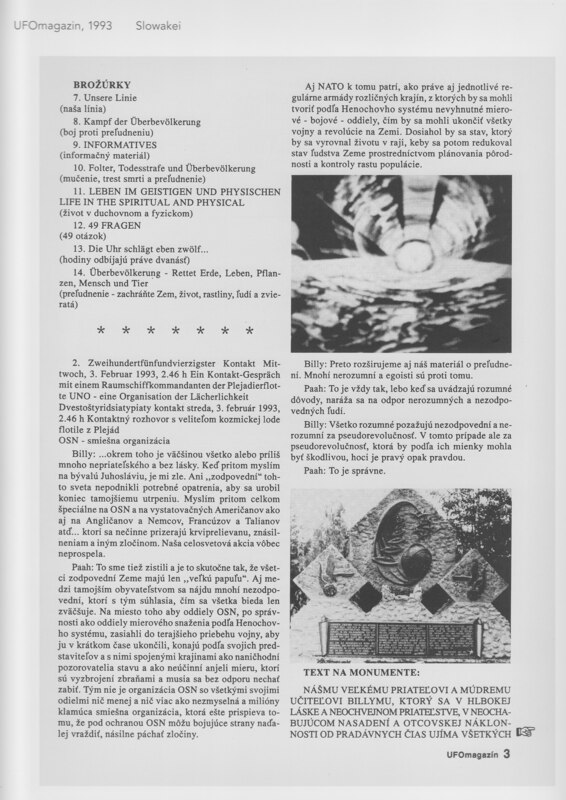 Following is the scan of a page from a Slovakian article published in UFOmagazin, where Universal Barrier picture was published. 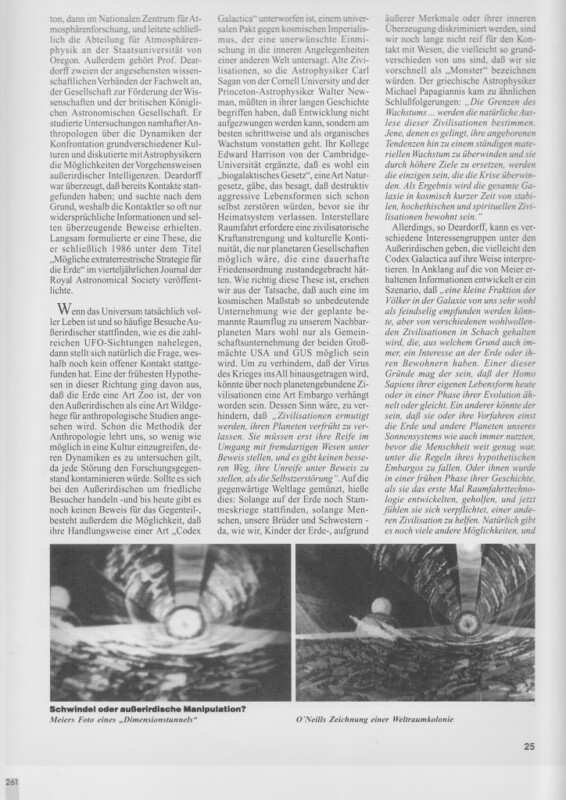 The entire article is on pages 233-238 in the FIGU book Ausschnitte aus Zeitungen und Journalen (2011). 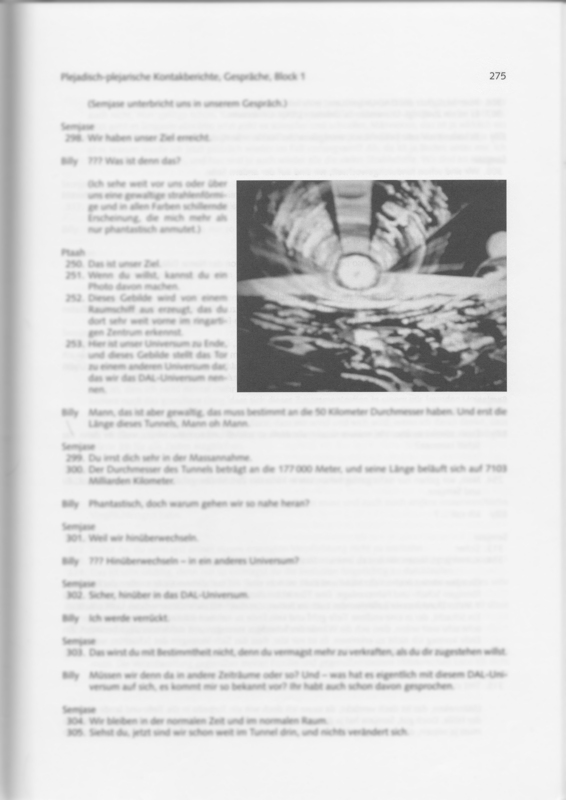 An English edition of Guido’s 1991 book ‘Und sie fliegen doch!‘ is published with the title ‘And yet… they fly!‘, which contains the same photos and response regarding the Universal Barrier on pages 206-208. Meier publishes the first block of the 3rd edition of the Contact Reports, Plejadisch-plejarische Kontakt Berichte Block 1. CR 31, which is about the space journey, contains a couple of dozen space pictures. The ‘Universal Barrier’ photo is published on page no. 275. Note: The text is intentionally blurred due to copyright issues, leaving out only the photographs. Another English edition of Guido’s 1991 book ‘Und sie fliegen doch!‘ is published with the title ‘And still they fly!‘, which contains the same photos and response regarding the Universal Barrier on page 173. Guido publishes an expanded 2nd German edition after his first German edition 1991 book – Und sie fliegen doch! which again contains the same photos and response regarding the ‘Universal Barrier’ photo on pages 346-347. No changes or corrections were made. Billy doesn’t own an unaltered copy of his original photo anymore which he could examine. He doesn’t know the meaning of the spherical forms/patterns. However, there were spherical objects around which probably belonged to the ship. He doesn’t remember because everything happened a long time ago. An of course there were no material objects in the „tunnel“.